My friend Betulia's dad told me I am his hero for making chilaquiles on national television. That coming from a man who came from Mexico with nothing in his pockets and built a life for his family in the U.S. He ensured his children got a good education and became self-sufficient, contributing members of society. The last time I saw B's dad, he was wearing a baseball cap at a fourth of July BBQ, and ribbing his kids about when they were going to make him a grandfather. I was comforted to know the quest for grand-parenthood transcends ethnicities. He looked relaxed and content. He had clearly succeeded. If anyone's the hero, it's him. 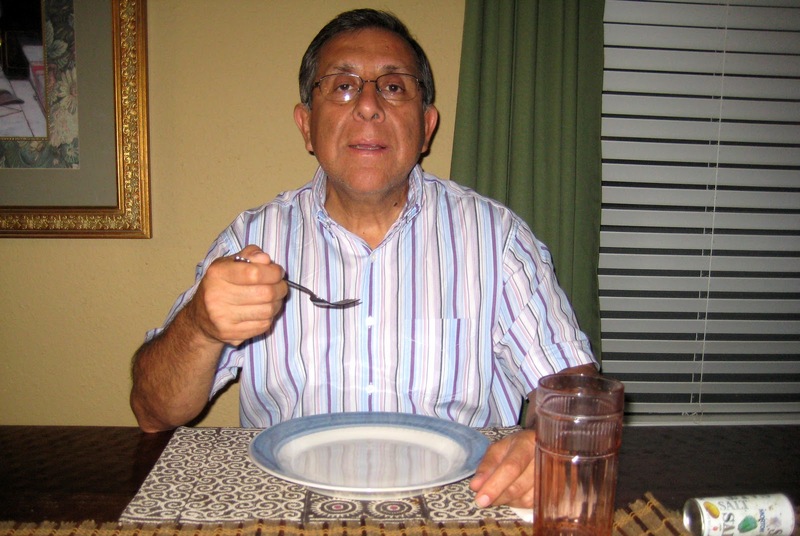 In talking chilaquiles, he said they have been a source of consistency throughout his life. His grandmother made them when he was younger, he made them when he was a bachelor, and his wife makes them on the rare occasion that he successfully convinces her that the doctor is wrong about his cholesterol. I tried to remind him that my version of chilaquiles got me kicked off of MasterChef but he didn't care. He was just glad I chose to honor the dish he grew up eating. Chilaquiles, derived from the word for "broken-up, old sombrero," are popular all the way from the U.S. border, through to Mexico, and down to Guatemala because they're a good way to use stale tortillas. Regional variations abound. In Sinaloa, Mexico, they are topped with a white sauce and in cosmopolitan Mexico City, they are served with a deep, roasted red salsa. And in late summer (like now! 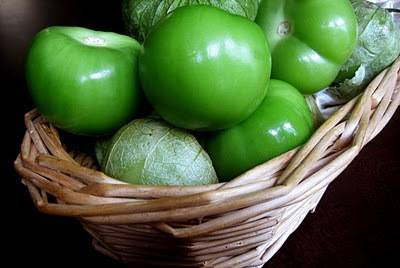 ), when the tomatillos are ripe for the picking, chilaquiles verde is the dish of choice. I couldn't help but think about B's dad and what his favorite dish meant months later when I found myself standing on the side of the road, eating a plate of steaming hot chilaquiles, served on a flimsy paper plate and prepared by a woman oddly reminiscent of my grandmother (if my grandmother barked orders in Spanish and ran a shiny food truck with a ruthless efficiency that would put the Soup Nazi to shame). It's a strangely communal experience standing with mothers pushing strollers, construction workers in hard hats, and businessmen with briefcases, eating a dish that is unpretentious, uncomplicated, and down right delicious. That's when I realized there's something special about this humble Mexican dish of leftover tortillas, eggs, and salsa. At first glance, it seems rather simple. 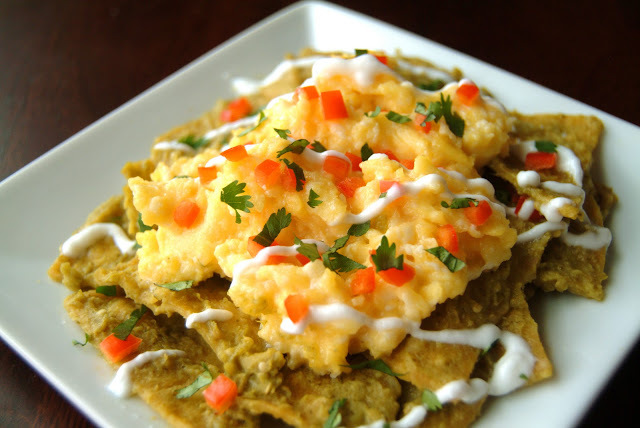 Fried tortillas soaked in salsa, topped with eggs, salsa, cheese and sour cream. In times of plenty, it's served with poached, shredded chicken. In times of naught, the chicken is replaced by refried beans. But either way, it's a dish designed to bring a family to the table so they can eat a warm, nutritious meal together even when times are tough. And that's where I went wrong on MasterChef. I took the quintessential, Mexican comfort food and crazily tried to make it sophisticated. So this time, I decided to make chilaquiles verde like the Mexican classic they are. Corn tortillas, creamy scrambled eggs, homemade tomatillo salsa, and homemade Mexican crema. While frying the tortilla wedges into crunchy chips, I recognized that although the components on their own are not particularly spectacular, something about combining them in one dish is uber-spectacular. And then I had to fry another batch of chips because well, I ate the first batch with salsa verde during my period of introspection. The true magic of the dish hit me once I finally managed to stop eating the chips and salsa and actually plate the dish. The tortillas absorb the bright flavors of the salsa while retaining the right amount of crunch, the scrambled eggs provide a creamy contrast, and the crema cools an otherwise caliente dish. Sunday morning, the hubster and I sat down to a brunch of classic, Mexican comfort food. And I knew B's dad was proud. B's dad, ready for his chilaquiles! 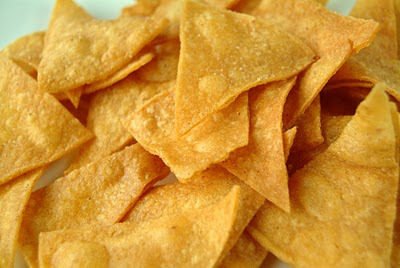 Heat oil and fry tortilla wedges until golden. Drain on paper towel and sprinkle with salt. Heat salsa in a skillet and add tortilla wedges. While tortillas are softening, heat oil in another pan and scramble eggs. 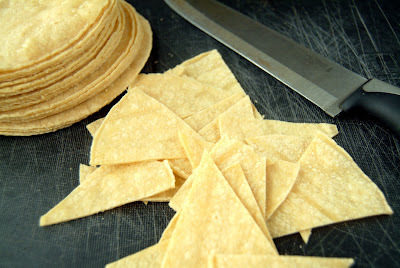 Remove tortillas from heat once they are soaked with salsa but still retain some crunch. Top with scrambled eggs, more salsa, crema and cilantro. Boil tomatillos in salted water until tender. Add to blender. Heat oil and brown onions. Add remaining ingredients once onion is soft. Cook for one minute. Add to blender. 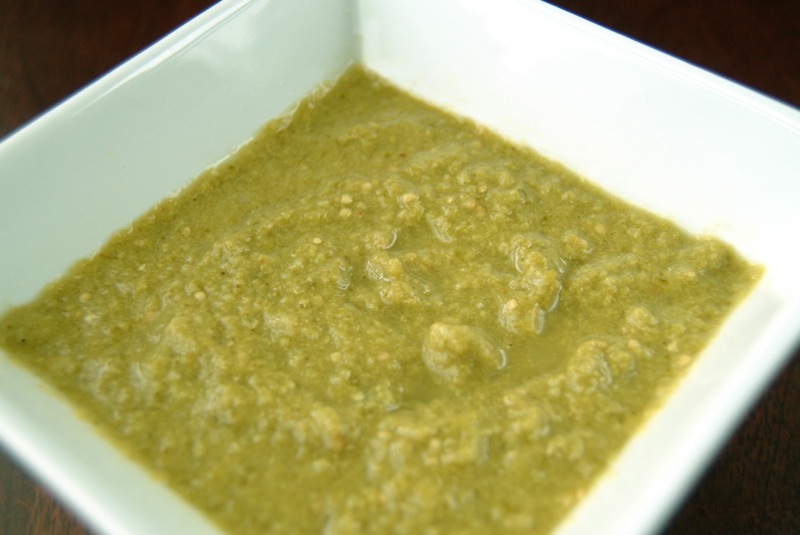 Puree with chicken stock or water until desired consistency. Add pureed sauce back to pan and cook for five minutes. What a fantastic story and a GREAT recipe! You can come over from brunch any day with a plate of that :-) Good luck in Round 2 - you totally deserve to get through!!! They may have gotten you kicked off the show but they just just might make you the next food bloggy star! I can't wait to vote for you!! What a cute picture of B's dad :-) I love chilaquiles, btw. I used to get them at Eatzi's in downtown Dallas and it was the guy who worked behind the counter's personal recipe. Yummy! Love your posting and will def vote for you when voting opens tomorrow. PS, I didn't realize you were on MasterChef! I'm considering trying out next year but wasn't sure. Will have to get your thoughts on your experience later. that looks amazing! I love the concept of chilaquiles and have definitely made several variations of them! Mostly erring on the side of Migas! haha. I am going to vote for you again! PS- do you know why we have so many votes to give out when we can only vote once? Isn't it crazy where we draw inspiration from? B's dad sounds like a very inspiring individual! I am always amazed at people (like our parents) who came to this country with nothing and made so much of themselves. I said it before and I'll say it again - your MasterChef dish looked 100 x better than anything that has come out of my kitchen. Will be voting for you again tomorrow!! Oh baby this post totally rocks! I have already read 2 Mexican posts for the second round up (one is urs)and I'm loving them BOTH. My only problem is finding tomatillos can be so hard here and I just can't substitute it. Om nom nom! Damn, this looks great. I've never heard of these before you made them on the show. I applaud your creativity and ambition! You'll get my vote... again! Congratulations on making it through...I will be giving you another vote this time, too! Great post. Love this post and the story! I'm partial to my mother-in-laws recipe though, only cause then I don't have to make it. Will be back to vote for sure! It's always a pleasure reading your posts. Good Luck. If it's good enough for Papa B (as I'm now calling him) then it's sure as heck good enough for everybody else! Congrats on making it through to round #2 lady, and here's to round #3! Very brave make a second attempt at a dish that got you kicked off TV ;) I really enjoy chilaquilas--they're very comforting and unique. How funny! I made chilawuiles for Project Food Blog Challenge #2 also! Your version looks amazing. Next time I will try it with a tomatillo salsa. You totally have my vote! Beautiful post. Beautiful dish. Good luck on round 2 of the food blog challenge. Wonderful post. I love this dish, and now I know how to make it! Thank you. we were at a wedding where they served chilequiles very late at night. it is amazingly yum, and one of the ideas i was toying around with for mine. great job. my vote is yours. Awesome fantastic post! The dish looks and sounds great! I love B's dad's pose with fork in mid-air. What a great post. Your blog is always such a pleasure to read..I will be voting for you! I have tried this dish before, but I've never made it. Now I'm excited to give it a go! Thank you for sharing with us. I hope you have a lovely Monday morning! Lovely post- now I'm wanting Mexican food! Good luck in the competition! yeay for round 2! :) this is the chilaquilas i WANT to taste. we have a Mexican restaurant here but their chilquiles is bleh. everytime you cook something, i always imagine that huge hug Gordon R. gave you on Master Chef and think, "man, when will i be able to taste what she cooks?" :P lovely entry and can't say anything but all the best til round 10 for ya! I obviously only voted for you because of your dorky-looking glasses. HAHA just kidding (of course). Those tomatillos look so beautiful and everything looks just perfect! I WILL use this recipe! I have a favorite restaurant and I always order this for Sunday brunch. Anything that gets you kicked off of MC has to be out of your comfort zone, right? ;) Seriously, v.2.0 would have made Gordon cry. Nicely done. I love the fact that you decided to use this recipe ! Sounds like the perfect sofa comfort food. Will be rooting for you, can't wait to see what your luxurious dinner will be! congrats on making it to the next round! what a great post. i love hearing stories of immigrants (such as my family) who move to their dream country with nothing and build a whole new better life for themselves and their family. this recipe looks and sounds like such comfort food. great entry for round #2. best of luck with the rest of the challenge. i am def trying this out as an appetiser for my next entertaining session..also can we just used tortilla chips instead of frying the whole wheat ones??? Hey!!! I finally had the chance to watch the Master Chef episodes you were in!I was so excited, eventhough it happened a million years ago, i finally found a link herein Korea. This dish looks so yummy! I've never heard of it, but mind you, the only Mexican food we know of in NZ are nachos, tacos, burritos and quesadillas. Sigh. What a wonderful story and a beautiful dish! The salsa verde looks amazing! you have my vote! What a lovely story you've woven and that final pic is priceless! And I would mount this on a wall --- for God's sake you made this on National tele and who cares you got kicked out 'coz of it! You were on Masterchef! Nothing changes that....ever! Oh, I love chilaquilas! Nice job, you've got my vote. Love the story about B's dad that came with the plate of chilaquiles that you made. That's what blogging is about: food + stories. Well done! Best of luck in PFB! Chilaquiles are definitely comfort food in this family. these look delicious! Hey, congrats on making it to the second level of project food blog! Go You! Chilaquiles looks like an amazing dish, i'd love to try it sometime. Hello fellow lawyer food blogger! Great post; I love Mexican food. Bravo! I LOVED the story. The recipe, while wonderful, was just a small addendum. The warmth, love and meaning of why you made this dish transcended the actual making. What an awesome post. Voted! Again. Yay! Good luck! what a beautiful post! I love chilaquiles...they have to be one of my favorite Mexican dishes. And I think Gordon was totally wrong about sending you home for them on top chef. In my opinion, these sound awesome! I voted for you! You are fearless! and I love it. :) I could eat Mexican food (real mexican food I must add) all the time. Loved this post, and obviously you have my vote! I think I'm going to start making this for breakfast. In a way, one could say you've given me reason to get out of bed in the morning. Can't wait to see what's in store. Definitely voting for you again! Great dish and good luck advancing to the next round! I was at a Mexican baptism and they served this after the service. I hope going up four times for more wasn't rude! Yours look amazing, great post! What a great choice for round #2, Azmina - voted! I don't think there's anything wrong though with making comfort food sophisticated -- isn't that what Rick Bayless does on a daily basis? I wonder if Gordon would have kicked him off MasterChef too.... hmmm. Wow...I didn't realize you were on Master Chef. I watched but didn't know you till this challenge begun. I think that deserves a vote! Pretty cool! I voted for you! I voted for you because you werea nerdy-looking child with pink flying-saucer glasses and because you're my twin. I got kicked off PFB but I'll be damned if you get kicked out one round behind me. Hi Azmina, lovely post. I love chilaquiles and I love your recipe. Beautiful photo of B's Dad. Oh yeah, of course you have my vote. What a great choice. I love posts with a personal touch and good story. Got my vote! Great story and recipe! Hope we both make it to round three! I thought you looked familiar, didn't realize you were on Master Chef! Good for you to make this dish again and I love your story. You got my vote, good luck! Great post! I have always wanted to try chilaquilas. Nicely done. I voted for you! i don't know how i haven't come across your blog thus far - i love it! your post looks amazing, and i too, would have needed two batches of the chips and salsa - i can't get enough of that combo! would love to try your version. you have my vote! well, i thought your chilaquiles were a great idea on masterchef...he just didn't get it! so, go girl! This meal looks fabulous, and such a beautiful story to go along with it! You earned my vote! These look sensational and very comforting, and the story with it cemented my vote. If that's what old sombreros taste like, I'll take two! I missed Master Chef and I'm sorry I did but your Mexican is looking pretty masterful. Cheers! Mmmmm!!! Looks delicious!!! Thanks for sharing. What a wonderful pics you have here.